Christians in Context: from orthodoxy to orthopraxy. : Santa Christ? This is an excerpt from an article by Dr. Sinclair Ferguson that first appeared in Tabletalk Magazine in December 1997. It is now a chapter by the same name in Dr. Ferguson's book In Christ Alone. 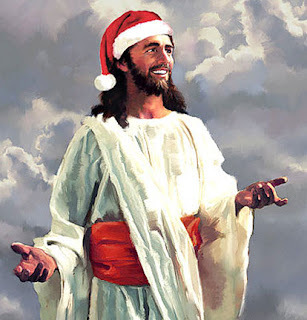 Santa Christ is sometimes a Pelagian Jesus. Like Santa, he simply asks us whether we have been good. More exactly, since the assumption is that we are all naturally good, Santa Christ asks us whether we have been “good enough.” So just as Christmas dinner is simply the better dinner we really deserve, Jesus becomes a kind of added bonus who makes a good life even better. He is not seen as the Savior of helpless sinners. Or Santa Christ may be a Semi-Pelagian Jesus — a slightly more sophisticated Jesus who, Santa-like, gives gifts to those who have already done the best they could! Thus, Jesus’ hand, like Santa’s sack, opens only when we can give an upper-percentile answer to the none-too-weighty probe, “Have you done your best this year?” The only difference from medieval theology here is that we do not use its Latin phraseology: facere quod in se est (to do what one is capable of doing on one’s own, or, in common parlance, “Heaven helps those who help themselves”). But Jesus is not to be identified with Santa Claus; worldly thinking — however much it employs Jesus-language — is not to be confused with biblical truth. There is, therefore, an element in the Gospel narratives that stresses that the coming of Jesus is a disturbing event of the deepest proportions. It had to be thus, for He did not come merely to add something extra to life, but to deal with our spiritual insolvency and the debt of our sin. He was not conceived in the womb of Mary for those who have done their best, but for those who know that their best is “like filthy rags” (Isa. 64:6)—far from good enough—and that in their flesh there dwells no good thing (Rom. 7:18). He was not sent to be the source of good experiences, but to suffer the pangs of hell in order to be our Savior. You can read this article in it's entirety at the Ligonier Ministries blog. What a gut-punch. -- Thanks for posting that. - R.T.